Fitbit Flex 2: The waterproof tracker is smaller, lighter, and better looking than the old Flex but it’s still got a few issues. 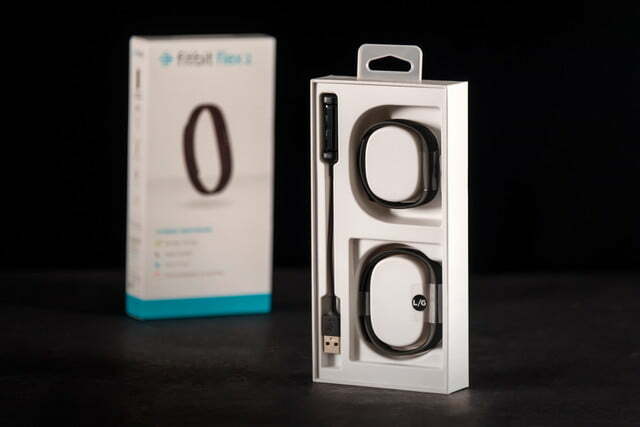 The Fitbit Flex 2 is Fitbit’s encore device to its incredibly popular 2013 Fitbit Flex. The smaller, cylindrical tracker fits into a variety of thin silicone bands or can be housed in one of the new, more attractive bangles and necklaces offered as an additional upgrade by the company. The Flex 2 still gets the original Flex’s five-light array, but it can tell you more than the old 2013 version could. Using Fitbit’s new SmartTrack system, rolled out last year, you can automatically track workouts like running or bike riding without having to open the app. 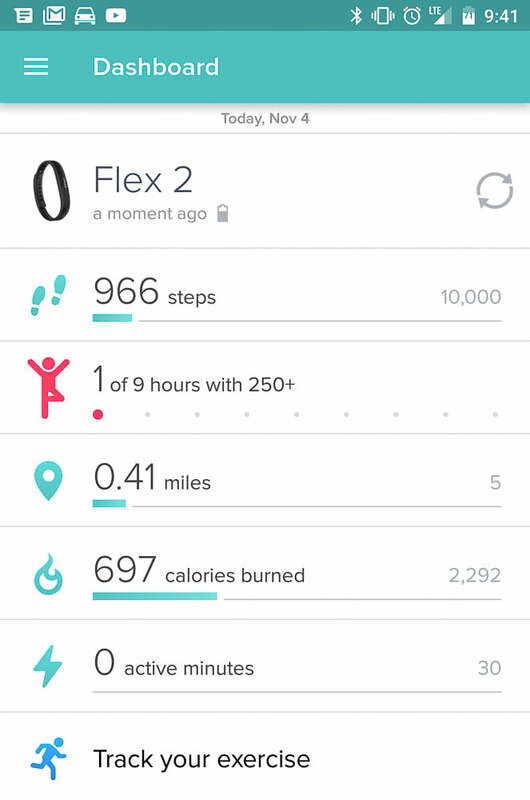 The new Flex 2 also gets Fitbit’s Reminders to Move, a feature that was previously only available in the Fitbit Alta. When you’ve been sedentary for too long, the Flex 2 will light up and buzz to remind you to get in at least 250 steps before the end of each hour. In addition to smart tracking, the light array on the Flex 2 can be customized for different kinds of alerts whether they’re phone calls, text messages or pre-set goals through the Fitbit dashboard. So, does that mean that it’s worth the upgrade? First, the Flex 2 is more intuitive than the original Flex. Like other Fitbit products, it’s simple to set up and pair with your smartphone whether you’re on an iPhone or Android. The Fitbit interface on your smartphone is easy to understand and interact with and it’s simple to customize everything from notifications to alarms on the app. We’ve had multiple Fitbit trackers over the years, everything from the original Flex to the new ChargeHR, and as has been typical of Fitbit, deleting old trackers and adding new ones is a bit of frustration. The app tends to look for the old trackers before allowing you to delete them and then re-add the new one. Moments after we first connected the Flex 2 to the app we got an ad asking us if we’d like to upgrade to a Flex 2 Tracker, too. 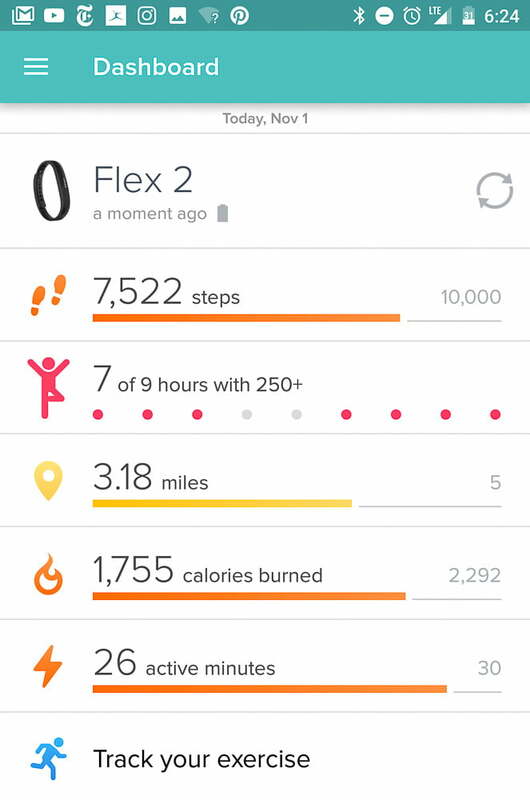 Once the Flex 2 is connected it is easy to navigate through the app to find settings, alerts, alarms and track your weight, food, and activity. If you want a more robust experience you’ll need to login to the Fitbit site online. There you can upgrade to Fitbit’s Premium account for $49.99 per year, which will give you data on everything from how your activity stacks up against others in your age group to the balance of macronutrients in your diet. Physically, the Flex 2 is considerably smaller than its predecessor. 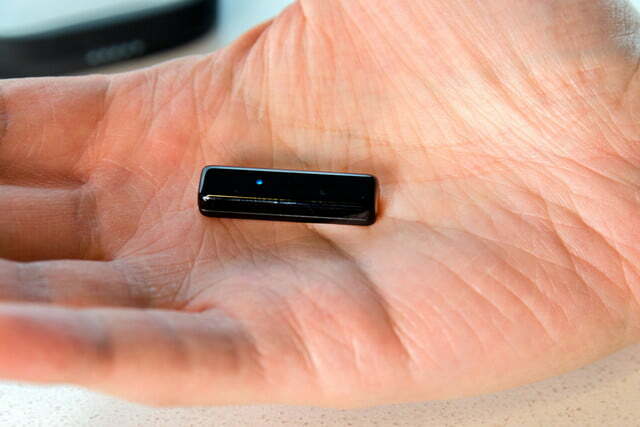 The tracker itself is just 31.7 x 8.9 x 6.8 mm and weighs just 0.83 ounces making it 30% smaller than the original Flex. It comes with slimmer large and small size silicone bands that you simply pop the tracker into and then clip to your wrist. The bands come in four different colors: lavender, black, magenta, and navy. In the past, light colored Flex bands (like the lavender or magenta) would get a strange dark tinge around the edges from everyday wear making the band look dirty and dingy. No measure of cleaning, soaking or scrubbing would get it out, either. Our test band was black so it wouldn’t show any of that kind of wear, but we’d be curious to try a Flex 2 with a lighter colored band to see if Fitbit has fixed the issue with their new herringbone style elastomer bands. One of the big benefits of the Flex 2 from an aesthetics point of view is that because of its small size, it’s far more comfortable to wear and it looks less like you’ve strapped a bicycle tire to your wrist. It makes the transition from professional to athletic without drawing as much attention to itself as the previous incarnation. 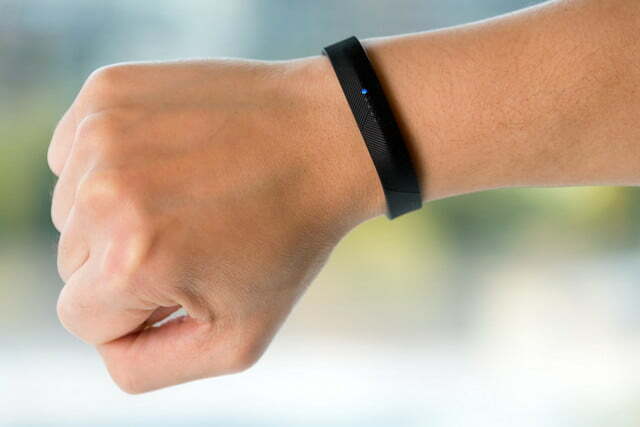 Fitbit is offering a variety of different ways to wear the Flex 2, as well. The original Flex was so ugly that it prompted a number of fashion and tech designers to create more fashionable accessories to hide the bulky thing. Designers both large and small (from Tory Burch to Etsy’s crafters) tried to create a more palatable way to count your steps when the Flex came out. This time around, however, Fitbit got smart and paired up with companies like Tory Burch, Simply Vera Vera Wang, and Public School, to create fashionable ways to wear your Flex 2. Prices and design styles are yet to be announced. Both replacement elastomer bands and the new designer lines will be available in 2017. You can also choose to wear your Flex 2 on your wrist or around your neck as a pendant by purchasing one of Fitbit’s Luxe Collection accessories. The accessories can be purchased in silver, gold, or rose gold. The base silver-colored accessories are made of stainless steel, and the gold accessories are 22k gold-plated. They range in price from $79.95 for the silver necklace to $99.95 for the gold or rose gold, and look like pieces of jewelry. 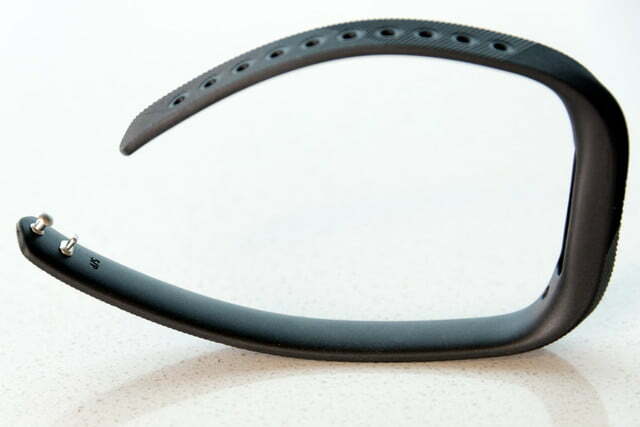 The Flex 2 is far more comfortable to wear and it looks less like you’ve strapped a bicycle tire to your wrist. While this is all well and good, it’s bad news for anyone who purchased accessories to go with the original Flex. We happened to have an old Tory Burch bracelet that fits the original Flex and we tried out the Flex 2 in it. While it fits lengthwise, it’s very narrow and rattles in the bracket when it’s closed. Because of all the play, the Flex 2 tracker falsely recorded steps and calories burned when we just sat on the couch or waved our wrist around. We also noticed some times when the Flex 2 falsely recorded or failed to record activity during our week-long test. As expected, any activity that didn’t jostle or quickly change the location of the Flex 2 in the horizontal plane went unrecorded and had to be added via the app later. Hours of intensive yoga teacher training and even parts of a high intensity SoulCycle class went unrecorded by the Flex 2. In the case of SoulCycle, only 18 minutes of the hour-long class was recorded. Fitbit says that this is largely because the accelerometer looks for activities that happen in the horizontal plane—so forward movement. On a stationary bike those movements don’t happen so the tracker is a bit less reliable. If you are an avid indoor rider or cardio gym rat, you’ll still need to manually add your activity through the app when you’ve completed it. Our first swimming test also went largely unrecorded, as well. 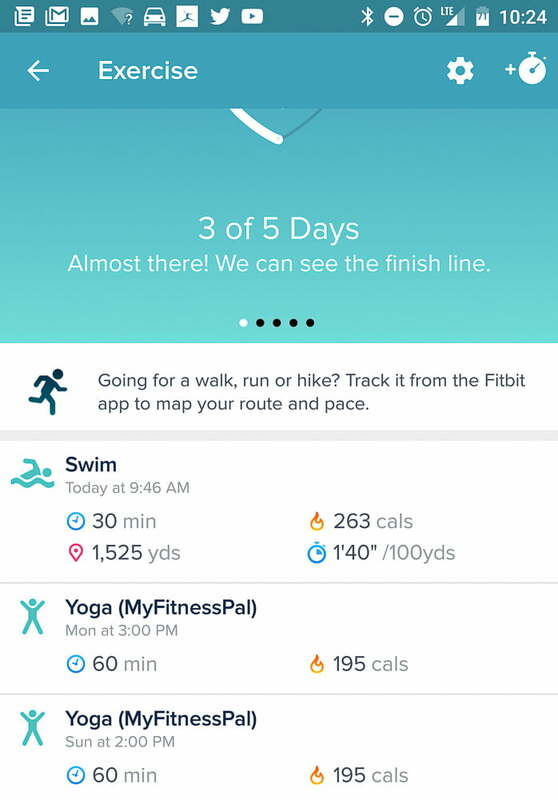 Fitbit says that the swimming issue can crop up because for the Flex 2 to recognize the activity, you need to have the swimming auto tracking setting activated. You must also set the length of the pool and the length of time of continuous swimming (say 10 to 15 mins) under another menu before the tracker actually begins to record the swim as an activity. Additionally, if you take more than 60 seconds of rest between laps, the Flex 2 stops tracking. We swam roughly 2500 yards (in a 25-yard pool) doing intervals of 100 yards with 15 to 30 second rests over a period of 45 minutes and only logged 5 mins of activity immediately after our swim. On our second test however, the tracker worked surprisingly well. We logged 1500 yards in just 30 minutes and averaged 1:40 per 100 yards, according to the Fitbit app. The only real hitch in the swim tracking is that you have to carefully monitor any breaks you take between sets to ensure that you don’t hang out on the wall for more than 60 seconds. If you do, the automatic tracking stops and you’ll have to do another 10 to 15 minutes of continuous swimming to get the tracking to start again. For someone doing interval training rather than distance training, this may be a problem. Finally, multiple times during our test, the Flex 2 recorded driving on a rough road as biking activity. At the end of the day, we had to regularly go back in and adjust our activity levels and delete multiple bike rides from the app to accurately track our activity. While the new Flex 2 is waterproof, it still needs to be taken out and dried off after a bout of heavy sweating, swimming, or showering. The silicone band around the tracker tends to trap water and Fitbit warns that the band shouldn’t be worn too tightly or allowed to remain wet for long periods of time for fear of recreating the Surge or Charge rash issues that the company faced back in 2015. Sleep tracking on the Flex 2 seems relatively accurate and because of the small size of the activity band it’s far more comfortable to wear to bed at night. It’s barely noticeable and doesn’t feel restrictive during the night hours. To charge the Flex 2 you must take the bracelet off and plug the small tracker into the proprietary USB charger. In our experience, it took about two hours to fully charge the Flex 2 from nearly dead. 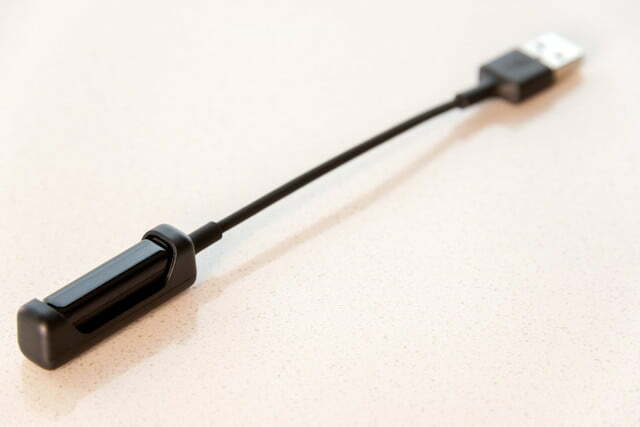 Unlike the original Flex, the Flex 2 does not come with a dongle to plug into the USB port of your computer. It syncs regularly with your smartphone and your phone sends the data to the online platform. The proprietary charger is simple to use, and you can see charging progress by looking at the lights on the tracker. We also tested the notifications and alarms settings on the Flex 2 and the customizable settings. You can set your Flex 2 to alert you to calls, texts, goal celebration, or progress towards daily goals, as well as reminders to move, silent alarms, and system processes like updates or pairings. A few times while we were in meetings or at lunch with clients, the Flex 2 vibrated on our wrist to let us know about an incoming call, and we were able to check our phone to see if we wanted to accept it or send it to voicemail. It makes for a really subtle way to stay connected without having to have a phone on the table during a meeting. We were surprised by how well the call alert system worked too. After getting out of the pool and rinsing off in the shower, the Flex 2 began to vibrate. The paired phone was inside a locker in the locker room (behind two additional doors) and the Flex 2 still gave us the notification that the phone was ringing. The warranty will cover product defects up to two years from the purchase date – or, if by chance you aren’t happy with the new Fitbit Flex 2, you can return the device within 45 days. 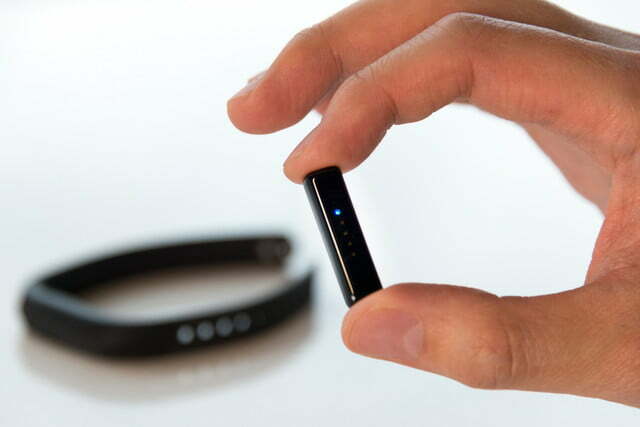 One of the great things about Fitbit is that if you lose yours (say, it falls off while you are jogging) and is found and returned to Fitbit, the company will track down the registered owner for return information. 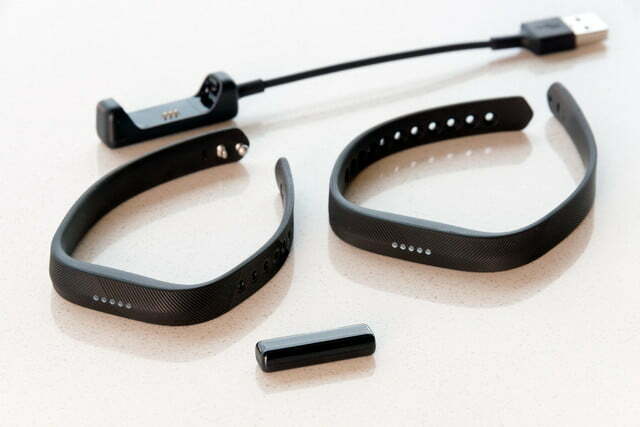 Overall the Flex 2 is an elegant and impressive fitness tracker at a fantastic price point. You no longer have to worry about looking like you’re getting ready to compete in the Ironman with the new jewelry style options available for the Flex 2, and you won’t ruin it by accidentally jumping in the pool or the shower. The only issue you may have is trying to track one down. Fitbit just reported its third quarter earnings and has said that because of the new form factor of the Fitbit Flex 2 they’ve faced some production issues with the new device. There are plenty of places to buy online, but your local Best Buy may not necessarily have one in stock. 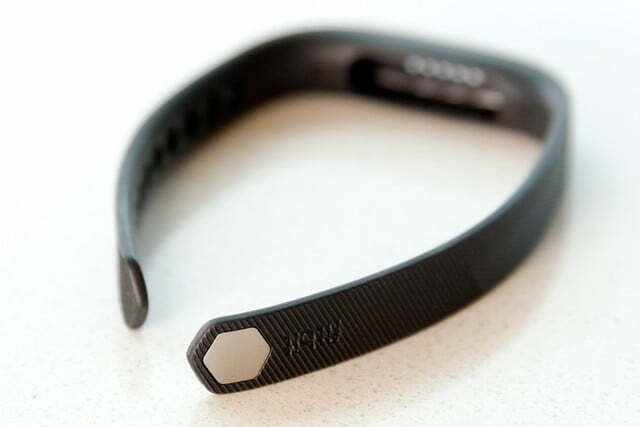 It’s good but it’s still not the final word in accurate activity tracking. Like all wearables, the Flex 2 is only as good as its data. While the Flex 2 gets the new SmartTrack system that recognizes specific workouts on top of a smaller, lighter, more compact and waterproof design, it’s still not the final word in accurate activity tracking. 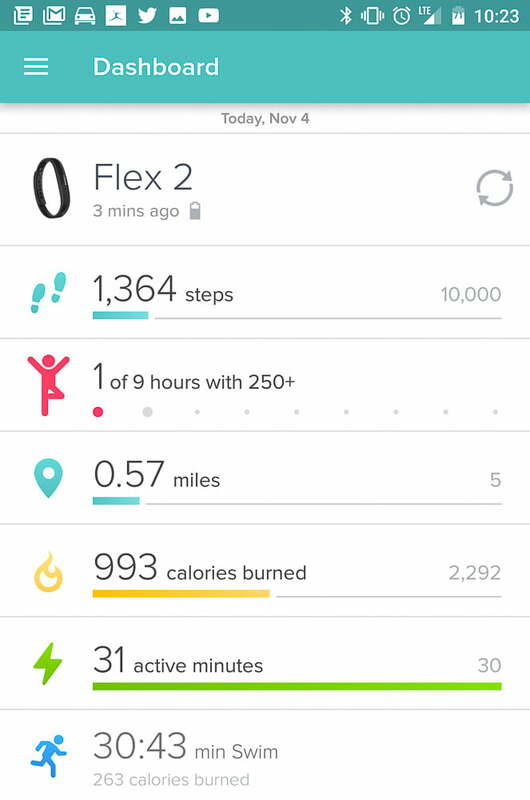 With some conscious setup via the app, the Flex 2 is good for tracking exercise and activity for the casual athlete. If, however, you want a more robust training measurement tool, it makes sense to step up to a more expensive device like the ones from Garmin or even Huawei which can track activities both wet and dry and give you more control over alerts and inputs from the interface on your wrist. For the price point, the Fitbit Flex 2 has no real competition. There is nothing on the market that is currently waterproof and offers swim tracking in a small, screenless form factor. The Misfit Ray is water resistant and good-looking but not waterproof and the Huawei Fit we recently reviewed is only water resistant up to 50 m and costs $30 more than the Fitbit Flex 2. 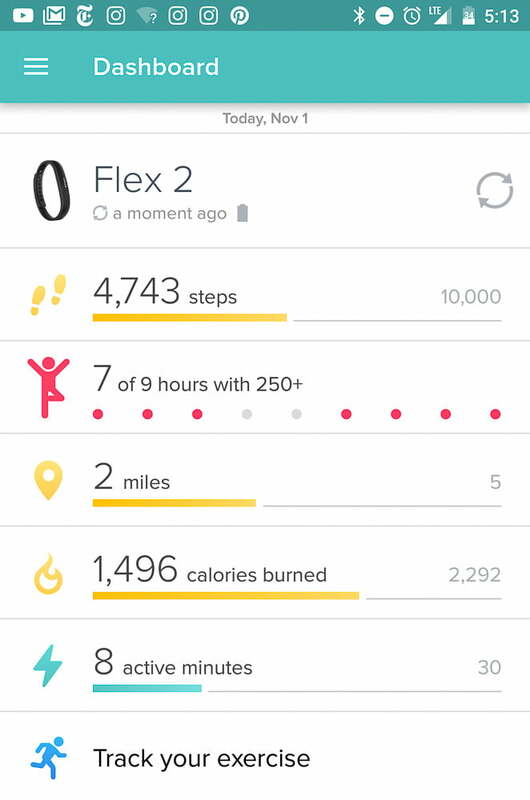 Fitbit says that the Flex 2 should work for a few years if used and maintained in the way that they recommend. 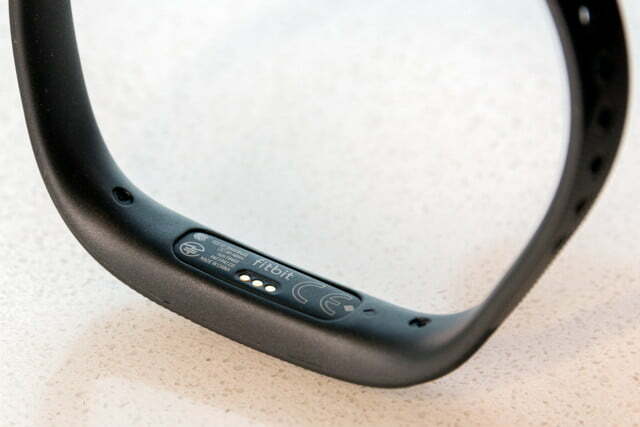 If their updates to the Flex are any indication, though, the form factor will continue to evolve and change making older bands and accessories out of date. While most analysts believe that the market for single purpose devices is shrinking and will continue to grow smaller, the Flex 2 is a good device given its size and form factor. If you are casual athlete and want to get a rough idea of the calories you burn in a day, the Flex 2 is a solid choice. It’s more rugged than its Flex predecessor and offers the additional bonus of being waterproof so there’s no risk of accidental water damage. 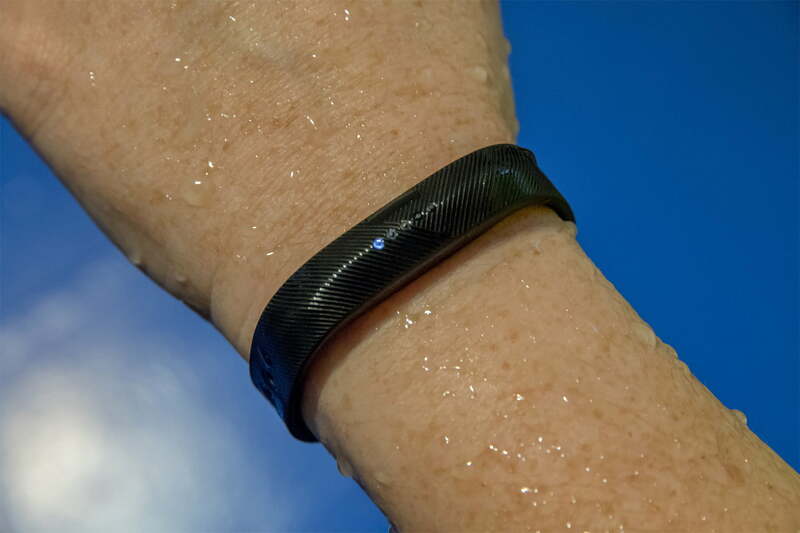 It offers some neat additional functionality, including activity smart tracking and swimming tracking. With new jewelry style bands and pendants available it looks a lot more like tech jewelry than a miniature bike tire strapped to your wrist.